Without snow, there was no skiing this winter break. No sledding, no snow forts, none of the usual winter activities that I had anticipated. By this time last year, we were virtually buried. But the thin crust of snow that was laid down by our first and only snowstorm of the year in early December has all but disappeared. The upside is that shallow, marshy portions of Mountain Meadows are perfect for ice skating. Sub-freezing nights and warm days melt and refreeze the surface, polishing it to a tempting sheen. 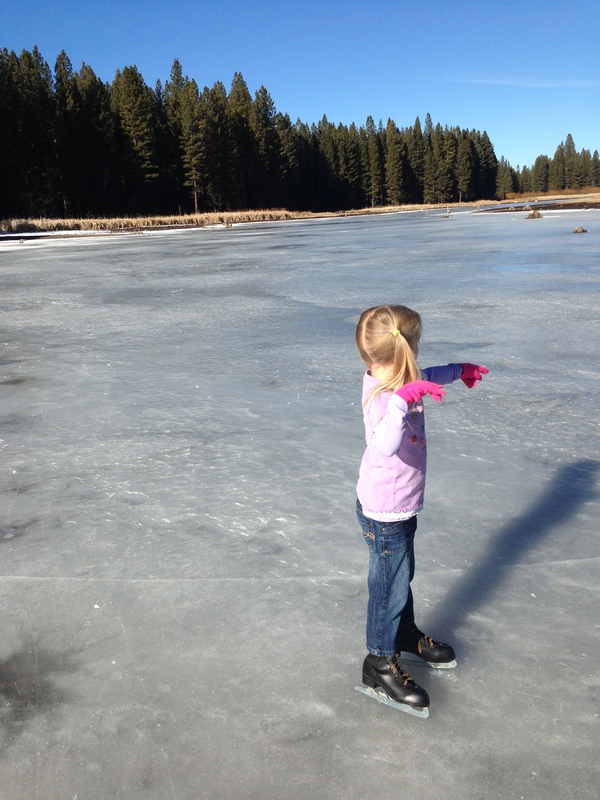 M. made it up on skates for the first time this year, and she is absolutely hooked. We’ve been out twice so far. Yesterday, a bald eagle perched in the trees above, watching her progress. The girls also remembered the fun that can be had with cattails, and harvested a bucket-load home with the hopes that they can be persuaded to grow in our yard. We’ve found more entertainment than we thought we would in this sadly snow-deprived winter. 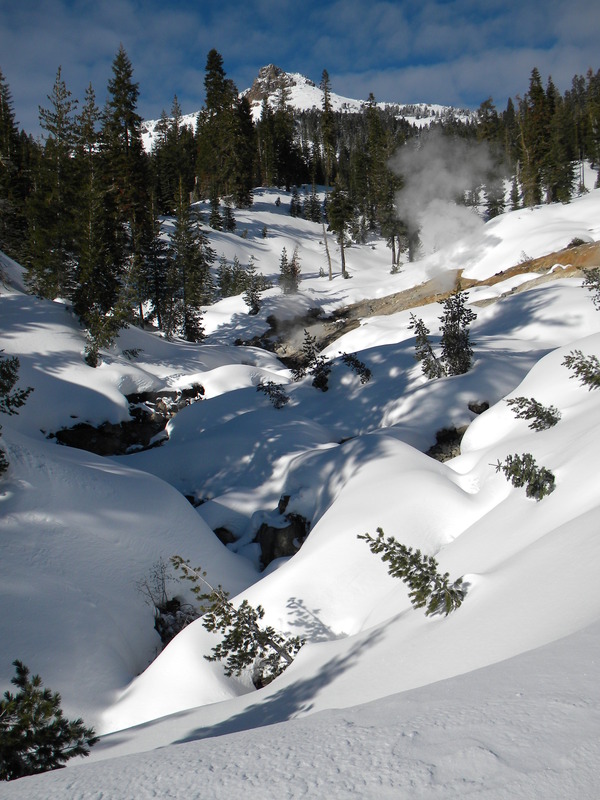 Snow still lays a foot or so deep across much of the landscape, but the enough had melted from the edges of Mountain Meadows that we could walk around its perimeter last Sunday. We never know what will catch the girls’ eyes on a winter walk. 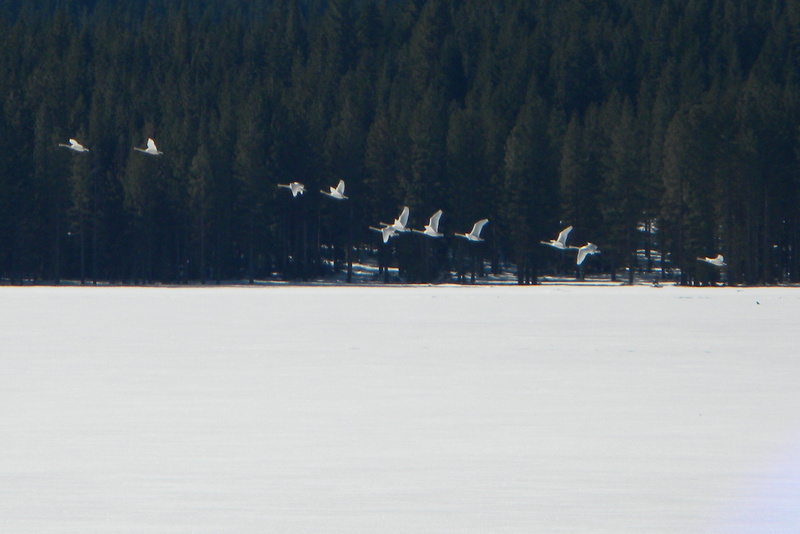 They began with the usual hucking of rocks onto the ice. Then an expanse of cattails (Typha sp.) at the shoreline caught our eyes. 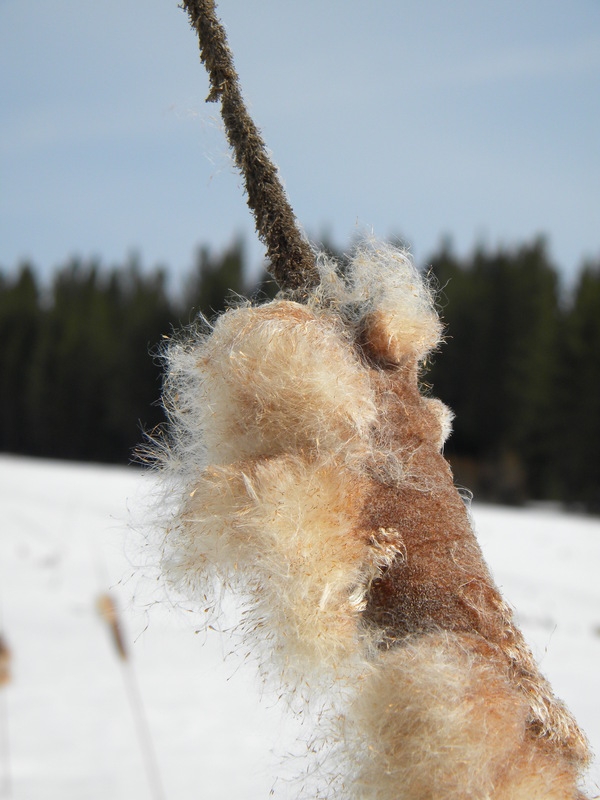 Did you know that each cattail spike holds roughly a quarter million tiny seeds? I certainly didn’t. 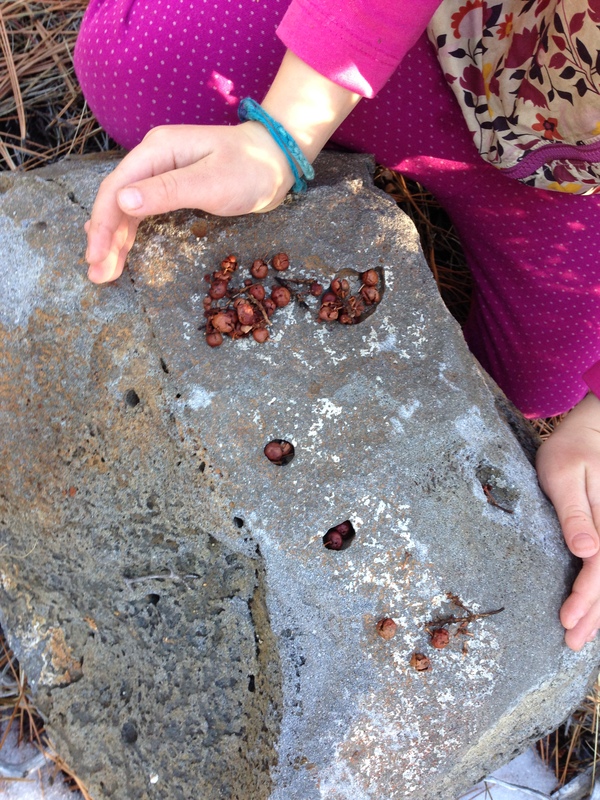 The dense compression of these seeds creates the brown, solid-looking cattail. 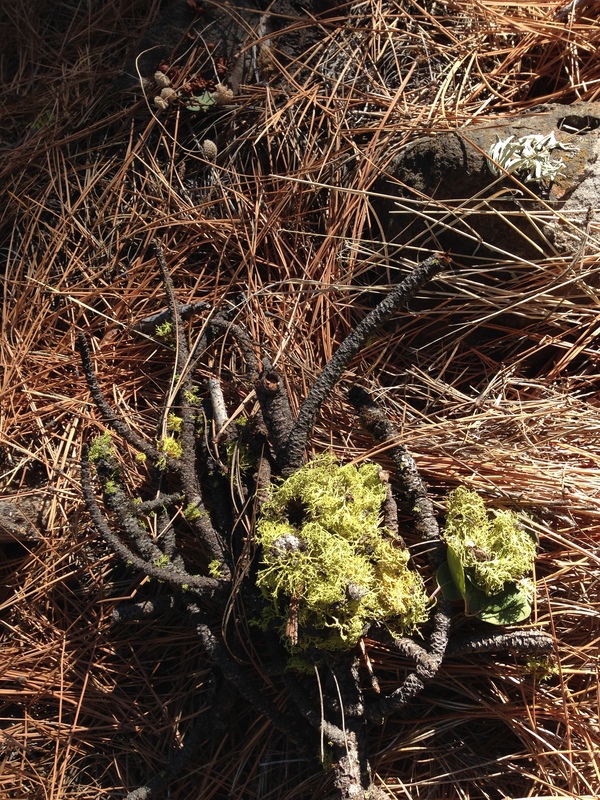 As we waved our cattail wands, seeds billowed out like smoke. Each tiny achene is attached to minute hairs that allow the seeds to disperse aloft in the air or afloat in water. Cattails are monoecious, meaning that its flowers are either male (pollen-producing) or female (seed-producing), but not both. Each cattail contains both male and female flowers; the male flowers on the upper portion of each cattail (the narrow portion of the spike as seen above) and female flowers on the lower, thicker part of the spike. The seed catalogs have begun to arrive. Despite the three feet of snow currently on the ground and the inevitability of more to come, we cannot help but think forward to our spring gardening. Plans are afoot to double our garden space and create beds that the girls can more easily access. We’ve promised them a little garden space of their own. So on today’s cold, crisp winter morning, we started to dream. 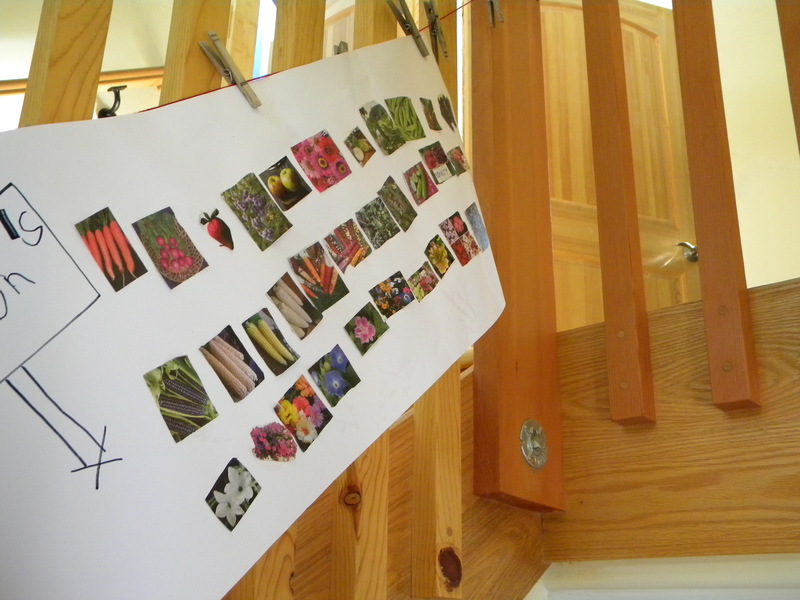 The girls each “planted” their garden by cutting images of veggies, fruits, and flowers out of duplicate seed catalogs. Then they pasted them into their own “garden” — M. into neat and tidy rows, as his her way, and A. into free-form patches which she then swathed in a rainbow of colors. They started with their favorites (carrots, peas, radishes), then remembered to add a few new approved tastes from last year. Kale to make kale chips. Turnips to eat with butter and salt. “Can I plant a fish?” asked A. And M. explained no, that she would teach her little sister how to catch a fish next year. “Can I plant macaroni and cheese?” was next. Again, no, but in theory we could plant the wheat from which the noodles are made. We’ve hung our gardens in the stairwell as a reminder that dirt lurks beneath all that snow, and spring is just a few months away. Over the berm it is a different world. Noise from the street and highway is buffered by an eight-foot high wall of dense, wet, snow that the snowplows have muscled into place. Houses are hidden from view. 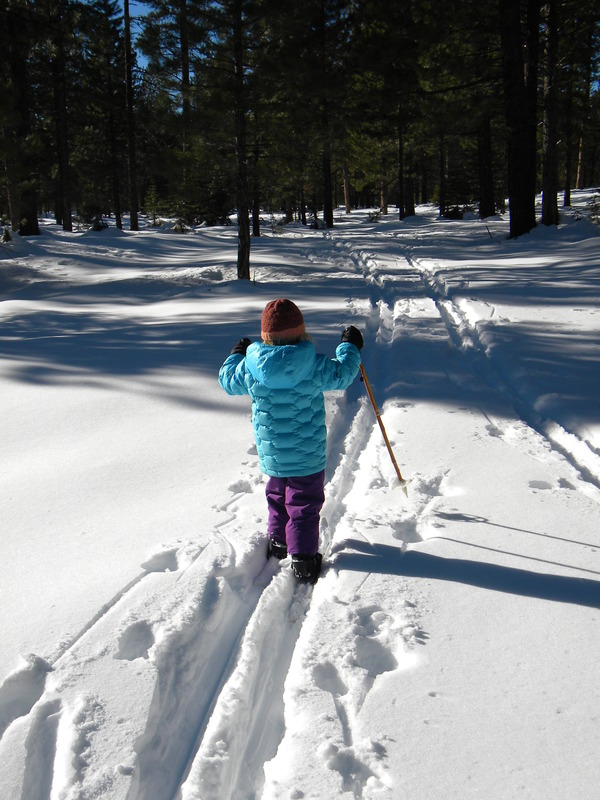 Animal tracks criss and cross our well-worn ski trail. And so it is that once we clamber up and over that berm, we feel as though we are in the middle of the forest, though really we are just a few hundred yards from home. M. has been out with me twice this weekend. She leads the way and I follow behind. Each time out she is able to steady herself a little better on the hills, and glide a little more efficiently on level ground. We venture just a little bit farther with every outing, marking our turn-arounds with a giant “M” traced into the snow. two feet and counting . . .
Winter is spot on in its arrival this year. Awoke this solstice morning to blowing snow that has so far blanketed us two feet deep. Two feet!! And this is just the beginning of a three-day storm. Grateful not to need to drive anywhere for the next few days. 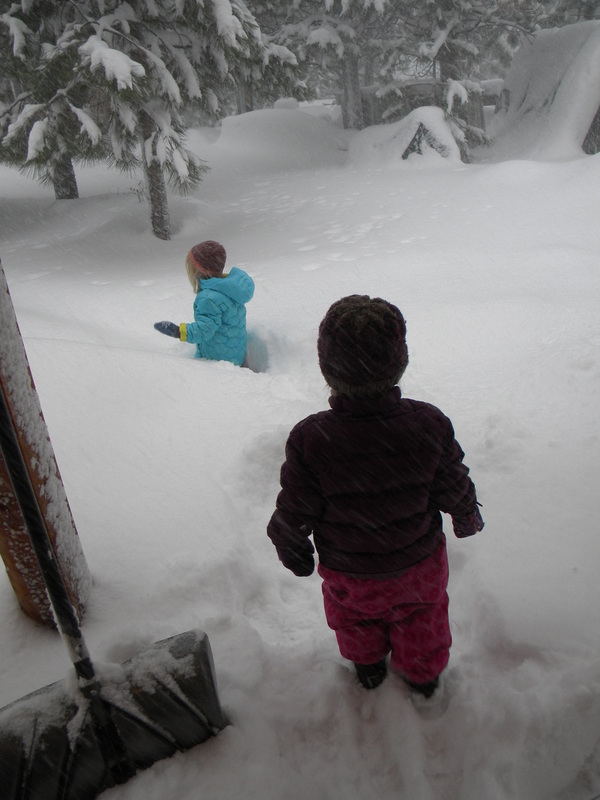 I bundled the girls up, and we headed out, ostensibly to play. Fun for M., who could scramble up a pile of milk crates and launch herself into the drifts. Not so much for poor little A. The snow came up to her chin and was a quite a daunting venture. She followed close at my heels as I shoveled a path to the cottage. We soon beat a hasty treat back inside for hot cocoa and gingerbread. Looking forward to Papa’s safe arrival home, then we can all hunker down for the holidays. Papa safely back home, now 30″ on the ground. Wow. We were all ready to go. Lunches packed, water bottles filled, early bedtimes achieved. An overnight forecast for a rain/snow mix loomed, but sounded tame enough. But this morning, we awoke to a relentless tangle of quarter-sized flakes sifting down from the sky. Chain controls on the pass made my decision an easy one, and so I let the girls sleep and made the mental shift from Workday to Snowday. An agreeable transition indeed! While most of the morning has been spent reading, painting and playing cards, we did bundle up mid-morning to find snow perfectly suited for shaping. 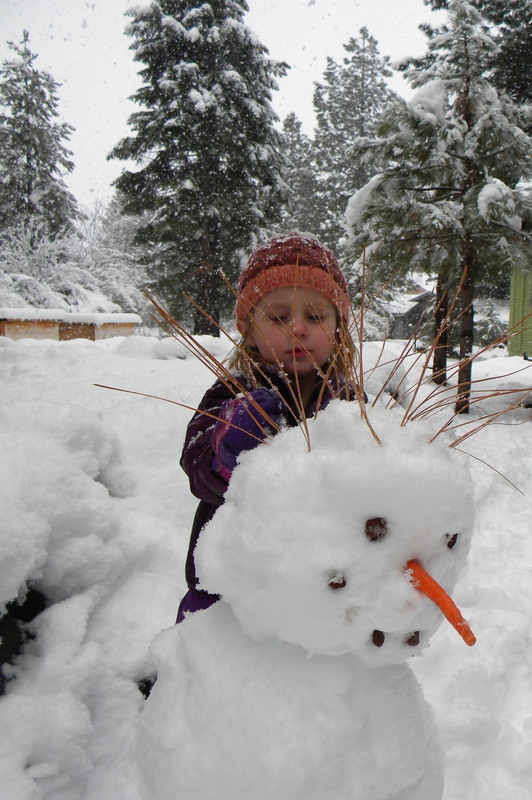 The pine needle hair-plugs were M.’s idea, and made for a very jolly snow maiden. M. asked me to bring out four carrots this time, remembering how little A. swiped the last snowman’s nose right off its face and had herself a snack! This time we all had a carrot to munch on as we worked, and our snow gal’s face remains intact.